This preview of fall’s top baking books celebrates easy American desserts of all kinds, from a creative chocolate-nut pound cake to a classic Southern lemon icebox pie. When her husband and children bought her an antique glass-domed cake holder, cookbook author Lauren Chattman pledged to keep a cake in it at all times. This spawned the 100 easy recipes in this book: classics and modern inventions, like the Nutella-spiked pound cake, all of which stay moist in a cake keeper (or just wrapped in foil). While pastry chefs can create daunting recipes, Karen DeMasco of New York City’s new Locanda Verde (and formerly of Craft) has put together a collection that any home cook can conquer. Out next month, the book includes a wide range of creative recipes, from ambitious (chocolate brioche) to experimental (burnt-orange cheesecake) to fast (the speedy shortbread cookies). New Orleans is an incredible source of sweets, from Bananas Foster to red velvet cake. 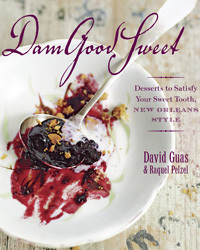 The simple techniques in this book (out next month) by New Orleans native David Guas and co-author Raquel Pelzel make even lesser-known treats like Roman Chewing Candy, a.k.a. Louisiana saltwater taffy, sound—and taste—delicious.